SINGAPORE - Singapore was the second largest Asian investor in offshore real estate in the first half of the year after China, according to analysis by CBRE. For China, outbound investment in real estate in the first half-year more than doubled to US$25.6 billion versus US$10.1 billion for the same period in 2016. Top destinations for Singapore capital in the first half of 2017 include the United States (US$2.4 billion), China (US$1.2 billion) and Australia (US$635 million). Across the region, Asian outbound investment into offshore real estate saw significant year-on-year gains in the first half of 2017. About US$45.2 billion of Asian outbound capital was directly invested into global property in the first half of 2017, according to CBRE, representing a 98.4 per cent rise year-on-year against US$22.8 billion allocated in the first half of 2016. Outbound investment from China remains the region's largest despite heightened regulation and capital controls, with Chinese sovereign wealth funds emerging as the largest single outbound investor class in the first half of 2017. But China-based property companies and conglomerates have also been considerable buyers of offshore real estate assets in the first six months of 2017. Ms Yvonne Siew, CBRE's executive director of Global Capital Markets - Asia Pacific, said: "Singapore investors are poised to become major beneficiaries of heightened China capital controls. 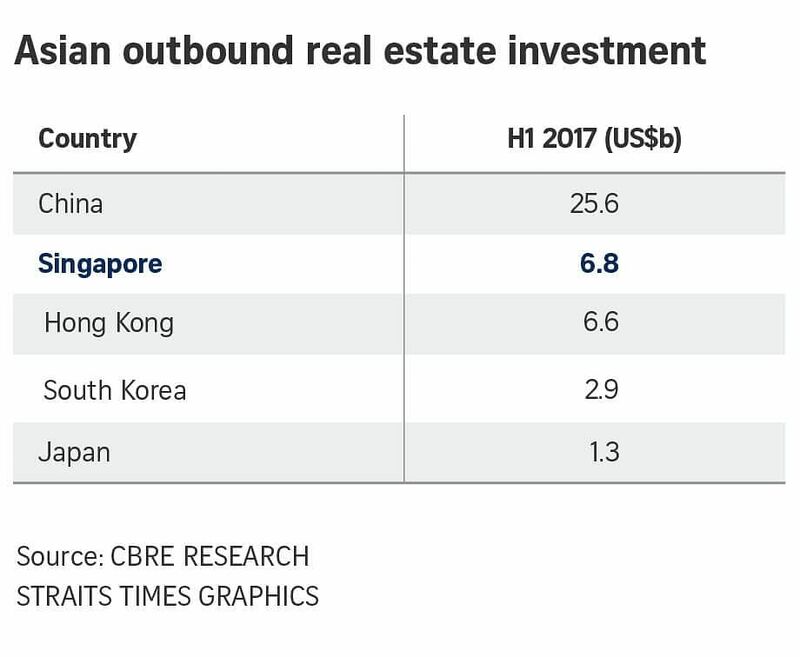 With the anticipated slowdown of outbound Chinese capital, Singapore investors have shown clear signs that they are both capitalised and confident enough to pursue outbound targets to both diversify portfolios and offset a competitive domestic landscape." A new round of capital controls issued by China's State Council, or Chinese Cabinet, and the National Development and Reform Commission (NDRC) was issued on Aug 18, with a focus on offshore real estate investments. But this regulatory move may not affect China's medium- to longer-term appetite for outbound investment, according to CBRE. "Our data shows that China remained the largest source of cross-border commercial real estate investment capital (both new and capital already circulating offshore) from Asia in first half of 2017," said Mr Robert Fong, director of research, CBRE Asia. "New regulations should help to ensure that future outbound investment is more financially sound and strategically focused, but the impact of Chinese capital on key global real estate markets should continue for some time."